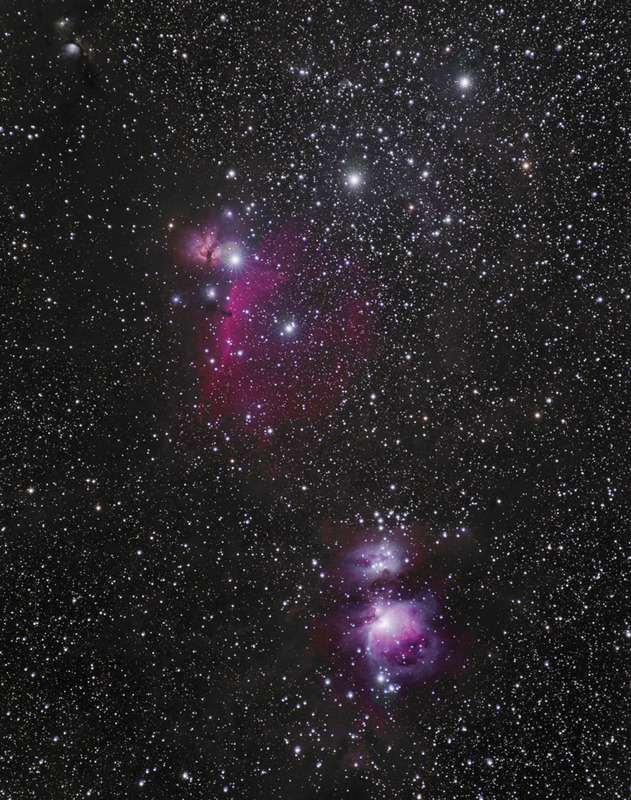 This wide field image shows the area of the sky surrounding the belt of Orion which can be seen as the three bright stars in the upper middle portion of the photo. At least seven well known nebulae can be seen: M78, the Flame Nebula (NGC2024), the Horse Head Nebula (IC434), the Lump Star Nebula (NGC2023), the Running Man Nebula (NGC1977), and the Great Orion Nebulae (M42 and M43). The image was taken at WSP 2008 when for some unkown reason the autoguider on the camera was not functioning properly. I did not want to waste such a great opportunity to image so I imaged this area unguided with the Nikon 180ED lens using 5 minute subexposures. Note: This image won 1st Place at the 2008 Winter Star Party for category "Wide Field"